This past year has been an outstanding year of progress for DB Sports Tours, both on and off the field. With a newly designed website, new partnerships agreed, new sports tours offered, and new players discovered, 2015 has been a successful year of growth for the company, with 2016 shaping up to be even bigger. Amongst all of the effort and hard work of the people involved, external recognition was plentiful for the company, with DB Sports Tours being shortlisted for an “Outstanding New Business” award, as well as being featured by AIB as a company to watch in 2016. Along with this, the Irish Independent wrote an encouraging preview of the business, with a positive focus on our plans for the future. All in all, 2015 has been kind to our efforts, and we hope to continue them well into 2016 and beyond. On the field, DB Sports Tours pushed forward with many successful projects over a broad area of operations. The company played a key role in organizing a visit to Barcelona’s famed La Masia Academy for coaches from Utah, in America – continuing the successful international expansion of the DB Sports Tours brand. On top of that, DB Sports were integral in organizing a trip to Portugal for the Kildare Schoolboy League’s U13’s and U14’s to play a Primeira Liga side, and also arranged for St. Francis FC to play matches against the likes of Birmingham City, Brighton and Hove Albion, Fulham FC and Nottingham Forest. On the girl’s side, DB Sports Tours helped the Metropolitan Girls League in their arrangements for a match against RCD Espanyol, whose men’s team play in La Liga. The NDSL Kennedy Cup squad also played against Everton FC, Bolton Wanderers, and Preston North End academies – all academies that have had a long history of producing players at first team level. These are just some examples of how DB Sports Tours continued to serve the Irish football community in facilitating arrangements for sports tours and international matches against quality opponents for young Irish players. When it comes to young Irish players, DB Sports Tours has also shown the quality of work that goes into spotting and promoting some of the best talent in Ireland. 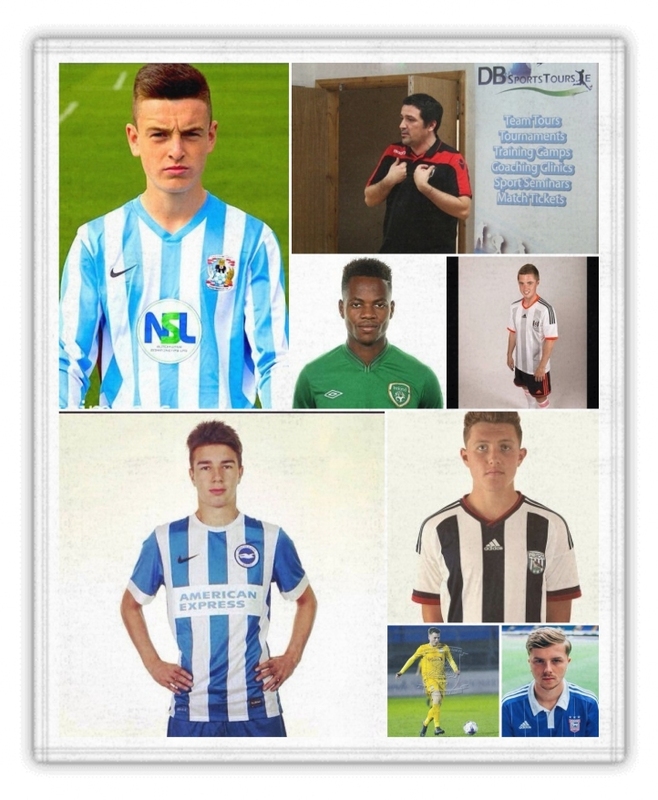 In 2015, DB Sports Player Management succeeded in placing 11 Irish youth players with professional clubs in the United Kingdom. Adam McDonnell made his debut for Ipswich Town in the English Championship, while Darragh Leahy captained Coventry City U18’s in the FA Youth Cup. For Preston North End Under 18’s, JJ Lunney finished 2015 as the top scorer, another successful protégé of the DB Sports Management camp. Continuing the good relationship with Preson North End, DB Sports Tours CEO David Berber signed his first Northern Irish international to the club, with Dylan Davidson moving to Preston North End to join up with Lunney, making a brace of DB Sports players at the storied English club. Other player highlights of the year include Noe Baba transferring from Fulham FC to Birmingham City, while also making his international debut for the Ireland Under 21’s. To cap off a very successful year for the DB Sports camp, the company represented a total of 4 players in the European Under 17 Championships in Bulgaria Zac Elbouzedi (West Brom), Jay Lunney (Preston North End) Darragh Leahy (Coventry) and Trevor Clarke (Shamrock Rovers). 2015 certainly finished as a successful year for players under the DB Sports Tours Player Management banner, and 2016 looks to be even more successful with some top European Internationals set to join the DB camp. With progress being made in both the business end and the player management end of DB Sports Tours, one of the major avenues of progress for the company in 2015 was in the club tours aspect of the services that DB Sports offer. Domestically, DB Sports had the honour of opening the Coerver Cup, held in Cork which was met with great success. On top of that, we organised the Summer Cup, which is now the biggest Small-Sided Games tournament in Ireland. More good news arrived with the announcement that DB Sports Tours became the official travel partners of the Schoolboys Football Association of Ireland (SFAI), opening up more potential to spread the word about the abundance of football talent in the Irish Schoolboy ranks. Internationally, we continued our partnership with Albert Viñas and Smartfootball Methodology, with a coaches inspection tour of Futbol Salou and Cambrills Park, taking in a game at the Camp Nou. The continued expansion into America included our first of many US Soccer Camps, as well as a partnership with the Presidio League in California. Closer to home, many teams and clubs utilized the DB Sports Tours services to arrange tours to English games (including 250 DB Sports kids attending Steven Gerrard’s last ever game for Liverpool), including Shelbourne, St. Kevin’s Boys, Rockmount FC, Knocklyon United, Portmarnock Fc, MGL Academy and many more. In total, over 80+ teams and clubs used the services of DB Sports Tours, a number that we hope to increase in 2016 with the MLS giants FC Dallas U10’s coming to Spain to take on the best of the best La Liga sides including FC Barcelona, Real Madrid, Atletico Madrid, AC Milan, Porto and Benfica. Overall, 2015 has been a good year for the business, and we would like to wish our partners and friends all of the success and happiness that we had, in the New Year and beyond!